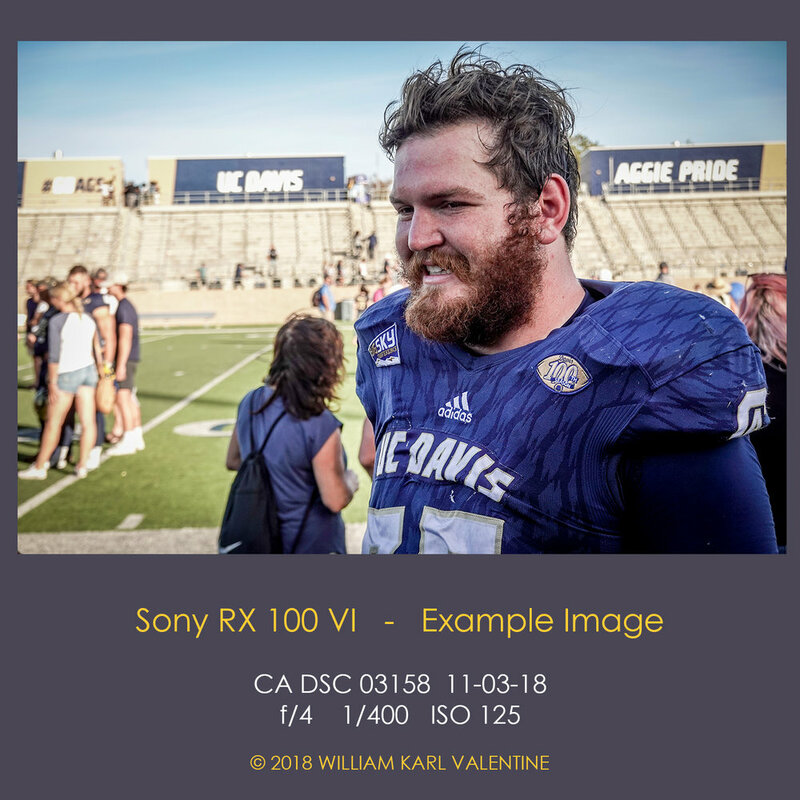 When I learned of the Sony RX100 VI being on the horizon I pre-ordered one. Usually I wait on cameras for the first batch to come out before diving in but with this one I was so impressed with what I heard the features were, and I know Sony is the standard now for sensors, that I put a deposit down as soon as I could. Due out September or October, I got mine July 20th and so far in the first few months I have been blown away by it. I have struggled to find a good digital camera for what most people would describe as my "Street Photography" images. With film I primarily used my Leica M4-P ,or at times a Nikon FM2, with a 35mm lens. My Leica is a great camera, some of my best images are from from her plus the act of photographing with a Leica is like a dance. On the street DSLR bodies focus well and produce solid images but the whole world sees you coming with one. I do okay shooting from the hip, literally, with my Nikon D500 on a Black Rapid strap (Note- Black Rapid straps have some liabilities, they loosen from the camera so you need to check them constantly and I have had the distance straps not hold... not recommending them but I don't know anything better right now), but it has not been ideal. Year ago I thought the Fuji X100 was going to be the answer but the software on the camera was brutal. Great images but the lag time from pushing the exposure button to actually capturing the image was forever. Lost so many images. The Fuji X100T was better but I just found too many limitations. I have done okay with Canon point and shoot cameras like the G Series (9-16) and the Canon G3X which has some insane capabilities. I thought I found a good answer a little over a year ago with the Panasonic Lumix DMC-ZS100. Great zoom and sharp images but I had bad results with low light. The ISO capabilities were way below my expectations. So, like most photographers, I kept looking (most photographers are addicted to new equipment so we are always looking). You can go to DP Review for detailed comparisons for all these cameras, great source. 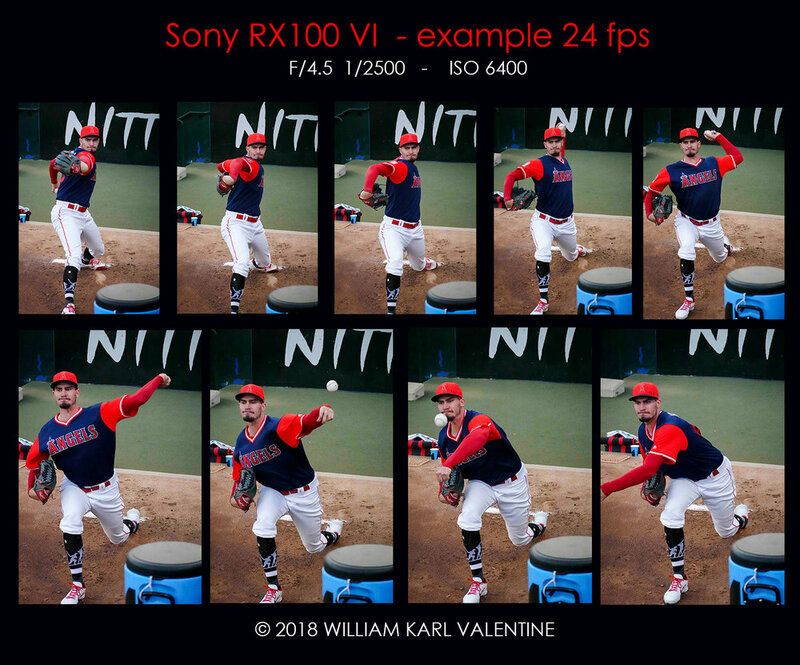 I want to keep this simple, there are other more detailed comparison reviews out there, so I am going to write about what sets the Sony RX 100 VI apart from the other cameras I have used. It's small, easy to put in a pocket, fits in the palm of your hand, and it does not stand out at all. Shut off the focus assist in low light if you don't want people knowing you are photographing - found that out through experience the first night I was testing it, but I find it is easy to hold waist level and photograph without being intrusive. I usually tilt up the rear monitor some so I can frame with a glance and the 24mm wide angle is perfect for walking through crowds on the street. I like the ergonomics of the camera. I added an optional rubber grip (thanks to the advice of my friends at Samy's Camera) and helped a lot. I know there are fewer dials on the Sony than the Lumix but I found with the Lumix that I was constantly brushing the dials and changing my setting accidentally and I haven't had that problem with the Sony. I may have to hunt a little more for some menu items but the things I usually change are readily accessible with the Sony so it has been fine. I like Sony's Function button and how the menu opens with it. I usually use that for ISO. The On/Off button is a little small and I have hurried to turn it on at times and searched for it, but when I am in the middle of photographing its not an issue. The 24-200mm Zoom Equivalent lens is solid. Sharp, good range, pretty much covers everything. The Camera's focusing capabilities are Insane. I am stunned at the images I have captured with this camera. It rivals DSLR bodies, it is rare I miss an image because it is out of focus, I can't say enough about that. The ISO capabilities are also better than any other camera this size I have ever used. The frames per second capability of this camera are out of this world. They list it at 24 fps and I believe it. Incredible what you can do with that but after a few seconds of exposure the camera takes a while to buffer all the photographs (but you can quickly capture over a 100 images...limit on burst is approximately 233). I used this camera to photograph my son during a hockey lesson and we could break down every move. This camera would be a great tool for people capturing any action sport where you can get relatively close. You have a great chance for lots of "Bat-Ball-contact" images, pitch release photos, shot release images, you name it (The only downside is a lot of images which you won't use, plus you'll fill the memory card quick and need a few extra batteries - but you'll probably get that shot you want). Downsides. Yes, unfortunately utopia does not exist on earth. The battery for the camera is extremely small. 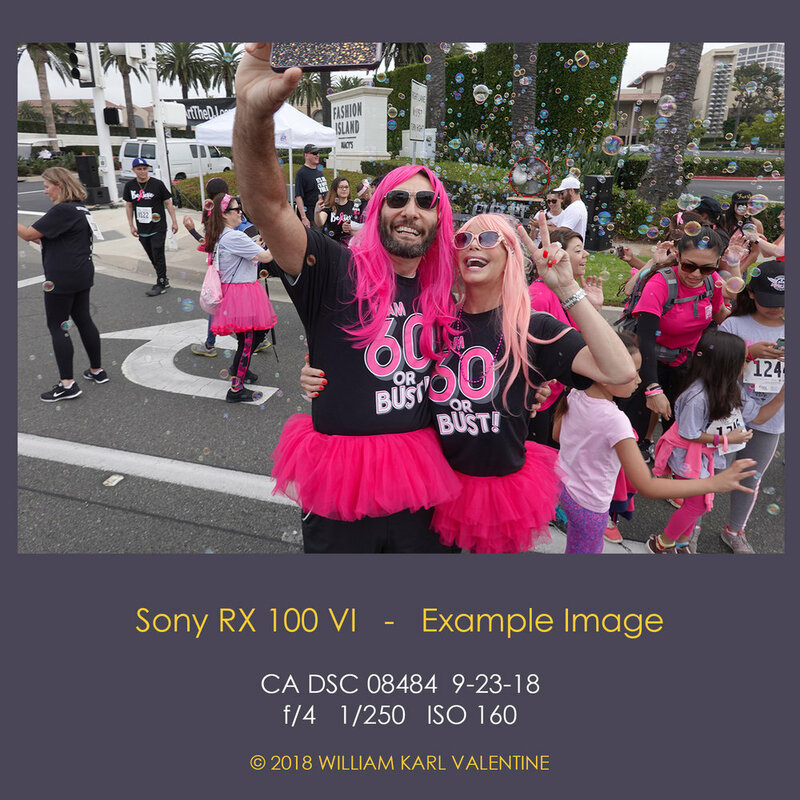 Sony advertises about 300 single image frames on a charge but I have exceeded that, probably because I was photographing continuously and not every frame was previewing on the monitor. You need to have extra batteries this camera. They sell an additional battery with an external charger for about $40 which is a good price. I remember I never bought an external battery charger for my Lumix because they were expensive, but the Lumix batteries are bigger and last longer. There also isn't a hot shoe for the camera but the built in flash is okay for up to 15 feet. The final thing which might discourage some people is the price of $1,200. To that I say you get what you pay for here, it's worth it. There is no perfect camera that does it all. If I had to choose one camera use with the requirement that had to fit in my pocket, the Sony RX 100 VI would be it. It has become my primary street camera and it is an outstanding back up camera to a DSLR if you are concerned about space and weight. It goes with me a lot of places now days. Sony is impressing me now and they have raised the bar again.